MMR is back. “US scientists back autism link to MMR” squealed the Telegraph. “Scientists fear MMR link to autism” roared the Mail. “US study supports claims of MMR link to autism” croaked The Times, a day later. Strap me to the rocket and print my home address in the paper, I’m going after them again. So what was this frightening new data? Well it’s hard to tell, since it hasn’t been properly published anywhere yet, so you can’t actually read it and form an opinion. This is now standard operating procedure for all scare stories, because journalists have learnt that informed and informative public debate on unpublished research is basically impossible. So it turns out that these three newspaper stories are all about a poster presentation, at a conference yet to occur, on research not yet completed, by a man with a track record of announcing research that never subsequently appears in an academic journal: Dr Arthur Krigsman. The story is that he may have found genetic material (RNA) from vaccine-strain measles virus in some gut samples from children with autism and bowel problems. Some believe that this could implicate the vaccine in causing health problems. But let’s not forget, the Daily Mail was promoting Krigsman’s research back in 2002 as well: at that time, he was putting endoscopes into the bowels of young children with autism, and said he had found evidence of inflammation. 4 years later, looking on PubMed, the standard database for all medical papers, it seems this research still has not been published in a peer reviewed academic journal. Forgive my bluntness, but it seems a shame to go poking around up there if you’re not going to write up your findings properly. Meanwhile the Telegraph says that Krigsman’s most recent unpublished claim is replicating similar work from 1998 by Dr Andrew Wakefield, and 2002 by Professor John O’Leary. But there is no such work from 1998 by Wakefield, at least not in PubMed (in that year he publishes his infamous, very different, and partially retracted Lancet paper on MMR, of course). Meanwhile it is well documented that other labs have tried to reproduce the 2002 O’Leary study and come out with different results, and that the protocol was likely to have problems with false positives because of the tests used: two perfect examples of the importance of research being fully written up and published, so it can be replicated and assessed. Oh, and the newspapers didn’t mention that Andrew Wakefield was also an author on the 2002 study along with O’Leary, nor that Wakefield is also very closely associated with Krigsman (they are doctors together at Thoughtful House, a private autism clinic in the USA). I could go on, but instead, here is the news you didn’t read: this month, in the May issue of the Journal of Medical Virology, there was a very similar study, only this one has actually been published. It looked for measles RNA in children with regressive autism after MMR vaccination, much like the Krigsman story. It used tools so powerful they could detect measles RNA down to single figure copy numbers. But they found no evidence of the magic vaccine-strain measles RNA to implicate MMR, and perhaps because of that unfrightening result, the study was loudly ignored by the press. Because it has been published in full, I can read it, and pick holes in it, and I am more than happy to do so: because science is about critiquing openly published data and methodologies, and in the real world, all studies have some flaws, to a greater or lesser extent. Often they are practical ones: here for example, the researchers couldn’t get ethics committee approval to use the tissue they ideally wanted to use (lumbar punctures and gut biopsies on children are a hard sell). And when they asked the anti-MMR lobby if they could have some of their tissue to work on, amusingly, they were ignored. Those who campaign against MMR make huge and detailed critiques of the published studies which suggest that MMR is safe. Sometimes they are spectacularly ill-informed: excepting that, it is quite right that they should critically appraise the literature. But in the spirit of science, the least they could do is share data, and maybe tissue samples, but most importantly publish their scientific work, in full, openly, before their peers, rather than the press. Mike, I hope you persuade many of your friends to not have their children vaccinated against measles, and then they all catch the disease from immigrants and die. Remember, the point of single jabs is that the measles vaccine causes autism, so single jabs really are a way to choose not to have the measles jab. I have a niece with multiple serious allergies who had special vaccinations and then stayed in the hospital for supervision afterwards. But I don’t see that lactose intolerance has much to do with anything. I expect you know that lactose intolerance is normal in all children and adults, after weaning and except for white Europeans, presumably because lactose exposure killed them all. I wouldn’t mind seeing vaccine intolerance going out the same way. I see what you are getting at, namely antibody-dependent cell-mediated cytotoxicity. This relies on Natural Killer T cells which express the appropriate receptors for IgG. I am not aware that this plays much part with measles, but stand corrected if this is indeed the case. Mike mentions the issue of parents’ perception. Does this go back to the earlier point of medicine being the victim of its own success? Perhaps parents no longer believe that their child can be killed by an infectious disease. My mother was old enough to remember people in her school (pre-war) dying of infectious diseases, and being scared of dying herself. When I was a baby in the early sixties, she had me vaccinated against everything available. Naturally, I tried to explain that really there is absolutely no evidence to connect MMR with Autism, whilst at the time trying desperately to change the subject, but I hadnâ€™t really expected that type of discussion â€“ I anticipated a response along the lines of â€œyeah, isnâ€™t the tabloid press patheticâ€. Itâ€™s not the first time Iâ€™ve made this mistake â€“ I just assume any reasonably educated person knows that MMR does not cause autism; Sometimes these people get quite upset when you try to point out that their beliefs may be mistaken. There seems to be a common theme with MMR, ES, homeopathy, audiophilia and so on, in that once certain people accept an idea no amount of evidence seems to be able to dissuade them. It seems that the oft-quoted Jonathan Swift line that â€œYou cannot reason a person out of a position he did not reason himself into in the first placeâ€ rings true but why should this be? Why do people insist on believing the most ridiculous ideas despite all evidence to the contrary? The worst thing from my point of view is that there are all sorts of bizarre ideas that cannot be challenged for fear of offending people â€“ witness the reaction to Benâ€™s articles on Brain Gym, Electro-sensitivity. Mike, it goes like this. If you believe that Dr Andrew Wakefield is a muddler and a pseudoscientific fraud, there is no reason not to go with the MMR virus. If you don’t believe that Dr Wakefield is a charlatan, you have to take account of his discovery of measles virus in autistic children’s bottoms, and evidently he has proved that both measles and measles vaccine cause autism, in your bottom. So option one is to avoid vaccination altogether. But you know that that’s wrong. Or maybe you don’t. Option two, if you’re middle class, is to demand separate vaccines for measles and mumps and rubella. But, remember – measles vaccine causes autism. So obviously you’re going to take the other two and skip that one. Are you telling me that you didn’t already think this through? That you have no qualms about your child receiving measles vaccine? I mean, that’s why doctors made a multiple vaccine in the first place – because patients wouldn’t turn up for all the individual vaccines at different times. Let me be clear here. I don’t welcome your tone in response to my original post but your point is valid. I do wonder though if we’re all so caught up in debating the politics v the logic v the science that we have failed to notice that this whole thing is possibly an area that just has incomplete research. Lots of, effectively, statistical surveys but nothing categorical. My child will be having the MMR under hospital supervision thanks to a severe reaction to cows milk and eggs. I remain unhappy with this but see little choice and that’s my point. How will you feel several years down the line if my child is autistic; research is complete and shows a demonstrable link in specific circumstances and, at the time, despite the research being incomplete, I was given no choice? PS: I was unaware it was a crime to be a middle class parent!!! Whatever causes autism, it is not the MMR vaccine. The research is far from incomplete â€“ MMR does not cause autism; There is no doubt whatsoever. If that doesnâ€™t convince you what research do you think could offer you categorical proof that MMR does not cause autism? There is a risk associated with everything we do â€“ one of the most dangerous things people do is to travel by road but most of us are happy to accept the risk. What choice would you like and why would you think that alternative to be safer? I donâ€™t think the term â€œmiddle classâ€ is particularly helpful in this context; stupid people with money can pay for single vaccines whatever their social class. I think the medical-scientific view is that the research IS complete, in that enormous surveys find no link between MMR vaccination and autism. As I and others have said here before, to find small effects you need big surveys (large sample numbers), so scientists and doctors find these large studies extremely convincing. When Wakefield and others raised the MMR-autism link, the regulators and the vaccine scientists decided to look into it. even though the evidence for any link was non-existent (as it remains). This “looking into it” is what has produced all the subsequent work which says the vaccine is safe. For instance, the Danish study, with a sample population of essentially all the children born in Denmark in almost a decade, found no evidence that there was more autism in the MMR-vaccinated population than in the non-vaccinated one. In fact, they ruled out any chance that there was more autism in the vaccinated group with an extremely high degree of certainty. The scientific/medical view would be that that is as conclusive as it is going to get. So there is loads of very careful, very good, very convincing evidence. It’s just that the MMR-scare anti-vaxers, and their media allies, refuse to believe it. They don’t base their view on evidence, but prefer their conspiracy theories. And despite all their efforts, they have produced NO credible scientific evidence on the other side of the argument (“autism danger from MMR”). This has been emphasised by several review panels who have gone through the evidence with a fine-tooth comb. What this means is that, as posts on this forum have indicated, the “evidence” advanced by Andrew Wakefield and his allies doesn’t stand up to any kind of scientific scrutiny. There MAY be some still unanswered questions, but these relate to methodology in the virus-in-the-gut hunting experiments, NOT to vaccine safety. An example of a question one could pose is “Why do some studies by some labs detect measles virus RNA sequences in some gut samples”. But in the face of at least equally good, and mostly scientifically FAR BETTER (published, properly validated by peer review, methods clearly set out) papers which do the same experiment and get the opposite answer (i.e. find that they can’t detect measles RNA, even though the methods are easily sensitive enough to find it if it were there), this is not evidence that a scientist or doctor would believe. And that’s evidence for as strictly limited a point as the virus being present at all in the gut, let alone anything else one could extrapolate from it. In a nutshell, the thing which keeps people thinking “knowledge incomplete” is that the media splash-report any study which says “measles virus found!” (even if it is only a conference paper) and fail to report the scientifically-sounder detailed studies which say “NB, couldn’t find any measles virus”. Hence the skewed perception. 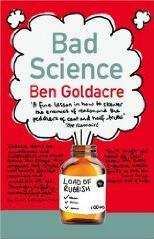 This is what Ben Goldacre was saying in the original piece at the top of the thread. I know these intellectual arguments are tough to weigh against a parent’s worries, and as a father I have been there, if that doesn’t sound too trite. Social class is a strong predictor of whether you will or will not read certain newspapers – if you find one left on a park bench, say. For my part I mostly gave them up when they were still broadsheets, and I only pick up a “Metro” for the Su-doku. Anyway, that’s how it bears on vaccination. Robert you claim that â€œSocial class is a strong predictor of whether you will or will not read certain newspapers – if you find one left on a park bench, sayâ€ but how do you identify the social class of someone in the first place? If I happened to be sitting on a park bench with nothing better to do Iâ€™d probably read a newspaper if I found one there â€“ what social class does that make me? However, my main objection to the term â€œmiddle-classâ€ is that it is little more than name calling; it doesnâ€™t mean anything. Just as an example â€œSu-doku is a middle class spelling of the middle class pastime Sudokuâ€. The scoring of areas of the country for “social class” or “deprivation” in studies like this is often based on a “basket” of “indicators of deprivation” – e.g. one well-known index (the Townsend deprivation index) uses ” unemployment, overcrowding, amount of owner-occupied housing and car ownership”. This study uses something more complex, also looking at ethnicity, education level and other things. First-off, vaccine coverage continues to be lowest in “highly deprived” (usually inner city) areas. This is probably just the vaccine version of an effect noted for all sorts of things related to health and health-care in the UK, which is that the inner-city poor get a raw deal. It is well-recognised that people in deprived areas get worse ACCESS to the health system for all sorts of reasons – less doctors, less easy to get to them, poor education and awareness, poverty stops people living a healthy lifestyle, etc etc. So better-educated “middle class” types may be vaccinating their kids less than they used to (the Daily Idiot effect? ), but it is still the more deprived areas that have the lowest levels of MMR vaccination take-up, as has always been the case. Interestingly, the MMR uptake figures after 2 years for all social groups follow the same trend with non-uptake increasing sharply in 1998 -99. So, the adverse publicity generated by Wakefield et al seems to have affected all social groups in a similar manner. 21 â€œMedical Veritasâ€ – a magazine dedicated to anti-vac propaganda (it says so on the website!) Does not seem to be peer reviewed and could not find on WOK or PubMed. Is is kind of funny that Wakefield is reduced to â€œpublishingâ€ his work these journals having previously got into Gastroenterology etc – I guess it shows how worthless his work is now. I will not bother reading the article; it is a non-article in a non-jounrnal. Next? Medical Veritas is a peer-reviewed medical journal published two times per year that promotes a circumspect consideration of vaccine interventions, including the deleterious effects of vaccines that are so often suppressed by other journal editors that have conflicts of interest with the pharmaceutical industry. For example, in the U.K. where a multi-billion dollar, class-action lawsuit is pending with respect to deleterious effects of the MMR vaccine–it is virutally impossible to locate a U.K. medical journal willing to publish such an article. Articles in Medical Veritas are considered to be scholarly and are methodologically sound. I would be happy to provide an electronic copy of the Wakefield article referenced and would be willing to publish a reasonable commentary addressing any areas wherein the manuscript was found to be deficient. To the contrary, instead of presenting non-articles in a non-journal, Medical Veritas articles have been used in expert court litigation and have contributed to both improved medical practice and policy.